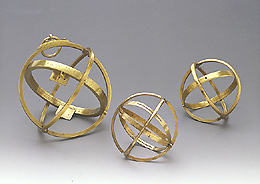 This astronomical ring dial (rightmost in the illustration) is fairly standard in design and construction for its type. It does however bear traces of an earlier scale on the meridian ring which has been removed. The hole in the meridian ring is presumably the point through which a string would be tied in order to suspend the dial for use when telling the time.